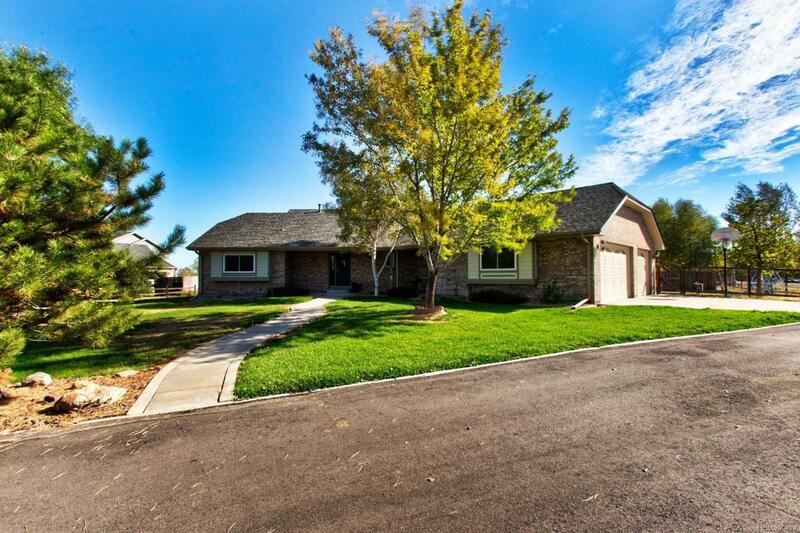 Awesome Ranch Style Home, Open Floor Plan, Over 4,500 SF on a 1 Acre Lot With No HOA! Great Location With Easy Access to I-76, 20 Minutes to Denver or DIA. New Roof, Gutters, Windows, Furnace, A/C, Carpet, Tile, Paint, Fixtures & Gas Heater in Garage! Well Maintained & Updated Featuring Newer Appliances, Chef's Kitchen w/Six Burner Gas Range & Cook & Hold Oven. Enjoy Entertaining by the Pool in the Summer & Year Round in the Huge Open Lower Level Family Room with a Full Bar. Ample Storage Space for All the Toys, Over Sized 3 Car Attached Garage w/8' Doors, A 20' X 24' Detached Garage, RV Parking on A Professionally Landscaped Lot w/ a Well for Irrigation, Zoned for Horses. This is a Fantastic Opportunity to Own a Completely Updated Property that Offers One Level Living, Great Spaces for Entertaining & Convenient to All Amenities! Move In Ready!